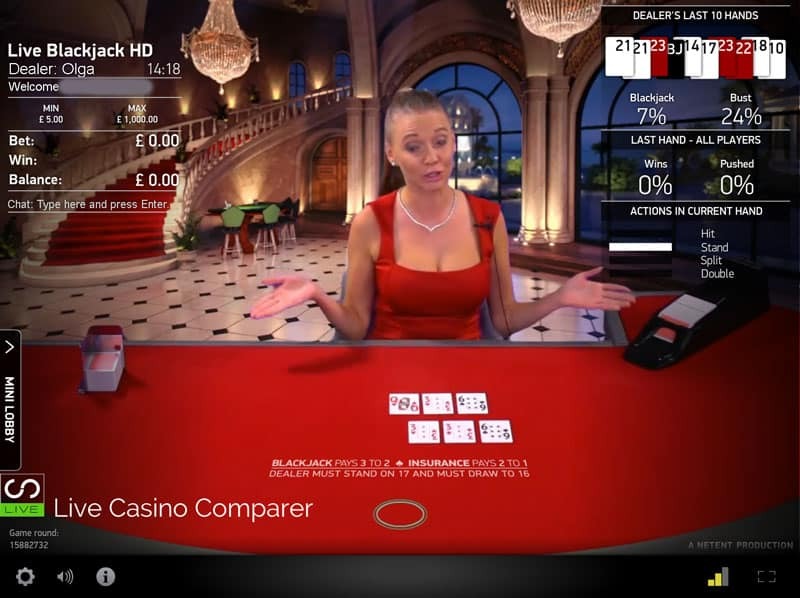 NetEnt Live Blackjack has a different look and feel from the standard studio Blackjack that we see elsewhere. It’s presented on a more one on one basis. There is no view of a big studio with loads of table in the background. What you get is a more modern take, a simple playing interface and the choice of two basic games. Operators have a choice of using just the generic tables or having dedicated tables. Some use generic tables with branded backgrounds. 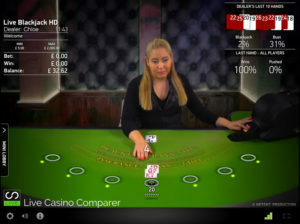 7 Seat Blackjack – The more traditional way of providing blackjack and virtually identical to the game you get in land based casinos. There are 7 seats and each seat gets dealt it’s own hand. All players play against the dealer with the aim of getting a better hand than the dealer without busting out. The game is dealt from either a manual shoe or a Shufflemaster depending on what table you choose to play at. The 7 seat tables tend to get full rather quickly, so the alternative is to play at the Common Draw table or a casino with dedicated tables. 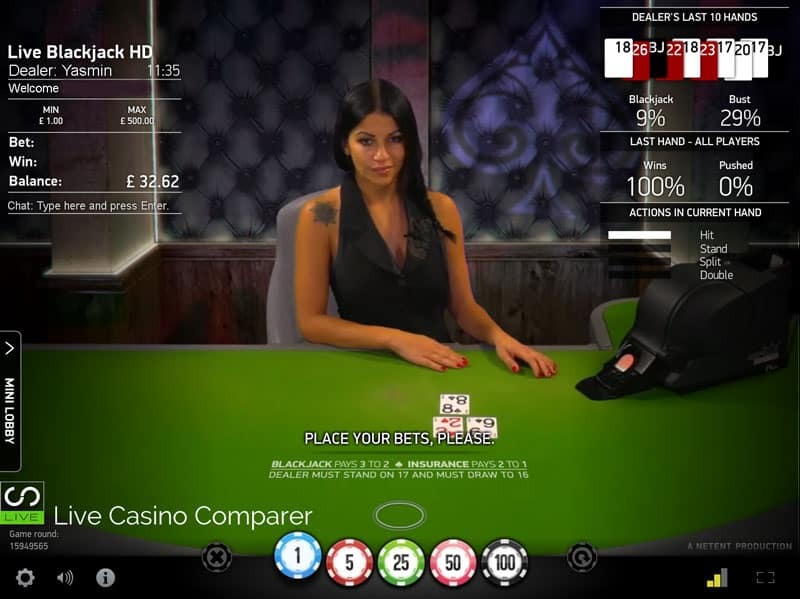 Common Draw Blackjack – Sometimes referred to as Unlimited Blackjack. This is a one to many game, where one player hand is dealt that an unlimited number of players can bet on. You play the hand as you see fit and your actions will be remembered when the hand completes. Your outcome will then be compared to the dealers and if you win you’ll be paid. When more than one table is open, one will have a manual shoe and the other will use a Shufflemaster. A three seat one to many game that’s played to perfect basic strategy. There’s side bets of perfect Pairs and 21+3. You can select to auto split and auto double depending on the strategy for the hand. 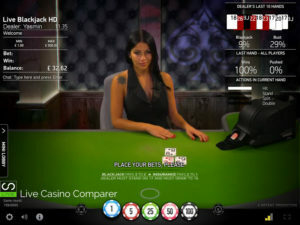 Following the betting round the player takes no further part in the game as each hand is played out by the dealer. 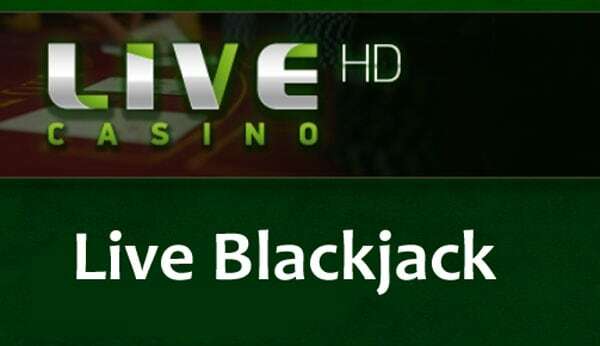 The basic rules of Netent Live Blackjack are the same across both versions of the game. It’s played with 6 decks, unlike most other live casinos that use 8 decks. Depending on what version of the game you’re playing you’ll either be dealt from a manual dealing shoe or one of the auto shuffler shoes (Shufflemaster). The game is played to European Rules (the dealer only takes one card). If you double on a soft 9, 10 or 11, the subsequent resultant hand is hard. If you have Blackjack and the dealer is showing an Ace you’ll be offered even money. Perfect Pairs – The players first two cards must be a pair to win. 21+3 uses the players first two cards and the dealers up card to make a poker hand. 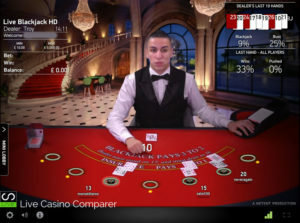 Netent Live Blackjack is available on Mobile and PC . 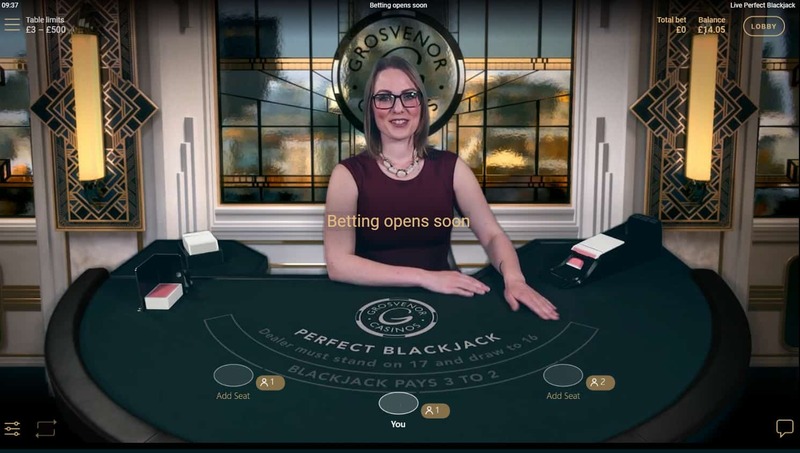 Regardless of what version of Blackjack you’re playing you’ll be using the same interface. It comes with lots of features and the really good thing about the interface is the list of last 10 Dealer hands. I really like this feature and wish all of the software providers did this. It makes it so much easier to see whether the shoe is for or against the player. Mini Lobby – This is normally hidden but when you click on the arrow it displays a scrollable lobby showing all tables and games. Chat – Chat is only available if you have a playing balance in your account. You can switch the display on / off. Video Quality – Low, Medium or High. The system will detect your connection speed and will try and optimise the stream accordingly. It can be overridden here. Full Screen mode – Displays the interface in Full Screen. 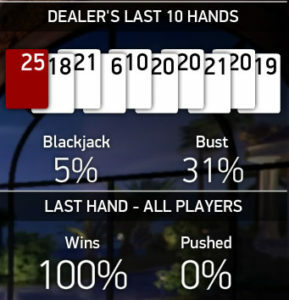 Dealers Last 10 Hands – Displays the dealers last 10 hands and also BJ’s and Busts as a percentage. Player Information – Brings up a panel that gives links to the Games rules and Game History which open in a separate window. Before cards are dealt you have to place a wager. You’l get the money symbols up for you to select. If this is your second time betting then you can repeat your last bet. If you make a mistake you can clear the bet and start again. After you’ve been dealt your first two cards you can take the following actions. Insurance – If the dealer has drawn an Ace you’ll be offered insurance. It’s half your initial stake and pays 2:1 if the dealer has a blackjack. Blackjack – If you have Blackjack and the dealer is showing an Ace you’ll be offered even money, which you can take or decline. Double – You double your bet and receive only one additional card. No more cards can be taken on that hand. Hit – Take an additional card. You can take as many as you like until you bust. Stand – Take no additional cards and play your hand as it is. Split – When you have a pair you can split them into two hands. Your bet is doubled at the same time. Each hand is then played out separately. You can only take one card on Split Aces and you can double on Split hands. NetEnt use a mixture of Manual and Auto dealing shoes. The manual shoes are just boxes that hold the cards that have been shuffled by the dealer at the table. A cut card is introduced about 3/4 of the way through the deck and when that is dealt the shoe is changed for a new one. The Auto Dealer & Shuffler is a device that shuffles the six decks after each hand. There is no cut card. You get a new shoe for every deal rather than every 4 decks. It was introduced to increase the hands per hour and reduces the human cost of someone having to shuffle the cards. My Advice is don’t play on a table with a Shufflemaster, its stacks the odds in favour of the house even more. I like to know that if there have been 10 Aces dealt so far that there are another 14 that could come out. A new shoe every time means that there are 24 Aces waiting to come out. The only downside to the use of manual shoes on the Netent live blackjack is they have the dealer do the shuffle at the table. This is probably the most absurd use of the dealers time. It’s beyond irritating if you just want to play. It must hit table profits for the casinos as the number of hands per hour are reduced because of this practice. If you get logged out or lose your connection and have already made a bet, your hand stands. You’ll be paid if your hand wins. The Netent solution has some things going for it and will appeal to a certain type of player. I think players who like to wager higher stakes will stay away from the games because of the game rules and use of the ShuffleMasters. There are only a few tables, especially when you compare them against Playtech and Evolution so at busy times it’s difficult to get a seat. 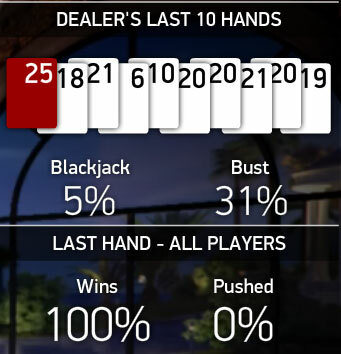 The last 10 dealer hands are displayed. You can double on splits. It’s a 6 deck game. The markings on the cards are too small so are difficult to distinguish even at Full screen mode. You have to rely on the computer generated number to really see whats going on. Use of Shufflemaster dealing shoes. You get a new shoe after every hand.